Dried chickpeas look like gravel. That gravel that people pay lots of money for to landscape their gardens. Looks good enough in those gardens, but the look isn’t immediately appealing as food. 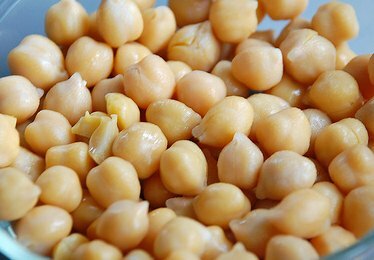 Most people think of humous when they think of chickpeas. Our bohemian house of course consumed massive amounts of humous – our excuse for overeating that and other things was that it was healthy and therefore essential. Humous is great and definitely worth making yourself, but chickpeas are great for so much more. They are actually fantastic in salads. You can add some to a normal green salad to add a bit of nutty crunch and extra fibre (the new buzz word in healthy cuisine!) 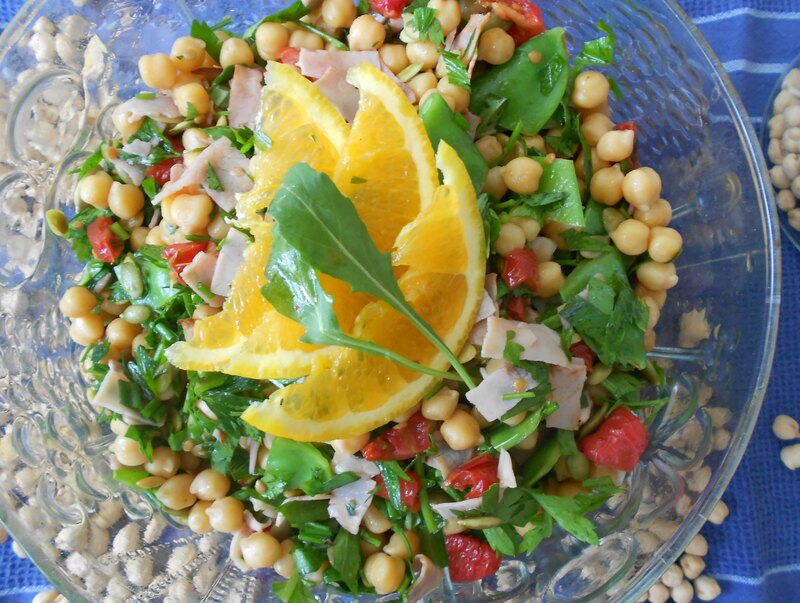 or you can base the salad on the chickpea as the primary ingredient. However, a chickpea salad can be heavy and kind of ‘mealy’ tasting so you need to add ingredients that compliment the textures and flavours. If you get that combination right, it will be a fabulous and genuinely healthy dish. Whisk all ingredients together. Try half of dressing first, and adjust gently if not initially enough. I love muffins. They are quick and easy to make and cover a whole range of moments when you need something sweet. You can put fruit in them or use wholemeal flour and claim they are a wholesome healthy treat. The other benefit is that the muffin dough doesn’t taste good, so you are never tempted to sample (or over sample) it as you go. Mix flour, sugar and butter until in crumbs. Put 1 cup of the crumb mixture aside in separate bowl. To other mixture add eggs, milk and vanilla. Mix with wooden spoon til just mixed. Gently add blueberries. Fill muffin cups. Melt butter and pour over set aside crumb mixture. Toss with a fork til mixed. Sprinkle on top of muffin batter. Bake at 170 C for about 18-20 minutes – will be golden brown. Makes 15 good size muffins. You know those weekends when you overdo it? It starts on Friday when you have a wine after work to wind down, and next thing you know there is a pile of wine bottles empty on the table. Saturday morning comes. You get up at the crack of dawn to take those beloved offspring to whatever sport starts 3 hours earlier than you need to be awake, your head is pounding and your belly rumbles ominously. You swear you will never drink again. But then at about 3 o’clock you start thinking hair of the dog is what you need to feel better, and then a couple of buddies pop over, and next thing you know you have another bigger pile of wine bottles empty on the table. Sunday morning is even scarier than Saturday, but thankfully the little sprogs have no sport on Sundays. After a few hours of agony you start thinking about hair of the dog again. What you really need is a serious health hit. Something to expunge all those toxins and reinstate some lost vitamins and minerals. This is when I make this tomato soup. Recipes abound for tomato soup, and I have tried lots of them, but this one is so fresh and light I can’t go past it. Wal calls it his liquid energy pellet. Saute onions, garlic and celery in oil, when onions start to become translucent, add spices and flour. Mix well and add 1 cup of water as bottom of pan starts to become sticky. Add remaining ingredients, and cook on low for at least an hour. The s0up cooks quickly but needs time for the flavours to infuse. The lentils are important because they break down and help to provide body to the soup, but if you don’t have any you can add a chopped potato. Blenderizing the soup is optional, I do it sometimes, but if you chop the ingredients finely it has a good texture as is. Serve with sour cream (or cottage cheese) and a generous topping of parsley and warm bread or toast. Don’t have a wine with dinner. When I was very young, my mother transformed herself into a new age bohemian – very different to the Eastern European kind. Our diet was probably one of the last things to fall under the spell of enlightenment, but when it did, we found ourselves eating all kinds of ingredients long before anyone else thought they were edible. Our household said goodbye to so many delicious necessities: fresh milk, butter, chocolate, red meat, sugar… the list goes on. In their place we had powdered skim milk, cold pressed sunflower oil, sunflower seeds and pepitas, soy beans, chickpeas, honey… the new list goes on too. And of course no alternative kitchen is complete without large bags of lentils in its pantry! For a long time I really hated lentils, especially the green ones. Every night for years one member of our household, I will call him Swami, boiled lentils. 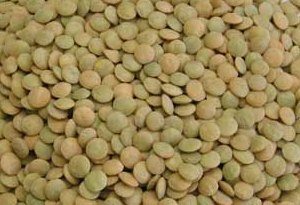 Plain boiled green lentils; no herbs, no spices, no salt, no anything at all to make them remotely appealing. And every night this tasteless sploge of lentils would be dumped onto the top of Swami’s equally uninteresting salad and chomped down while standing at the kitchen counter. It was hard to bear, even when you didn’t have to share. So after moving out of home I abandonned the mighty healthy but more mightily unappetising lentil. It was many years before I could contemplate them again, and I am not quite sure how it happened, but lentils have found their way back to my table. The thing is, you have to treat them right to make them taste good. A couple of key points about lentils: 1. don’t over cook them, they are not good as mash, and 2. they need herbs and or spice, desperately. 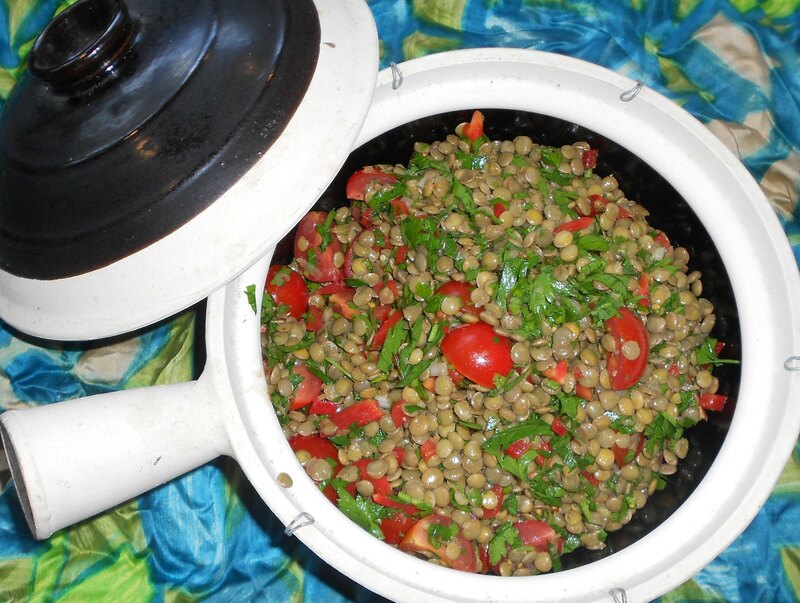 My current favourite lentil recipe is this salad. It is surprisingly light. Wal is asking about the eggplant. Apparently all those soft brown squishy bits aren’t enough to confirm that it is past its prime. Wal doesn’t cook much. So moussaka is off the menu for tonight. When all else fails, if you have eggs you can make something, so tonight we’re having quiche. Rub flour and butter together. If you don’t have a pastry cutter and don’t like using fingers, a fork will also work! Once well mixed and crumbly, add enough to make it stick together into a dough. Cover with cling wrap for 20 minutes to rest. Press the pastry into a 24cm pie pan – you can roll it but it’s a rustic looking dish so I don’t bother… Place baking paper over the pastry and fill with bakers beads, or dry beans or rice and cook in a moderate oven for 8 minutes. Remove beads and paper and cook for additional 7 minutes. Saute mushrooms and capsicum til soft, and steam broccoli til just cooked. Spread mushroom mixture evenly over pastry. Place chicken and broccoli pieces evenly on top. Whisk eggs, sour cream, milk, salt and pepper, and pour carefully over the pan, making sure vegetables stay evenly arranged. 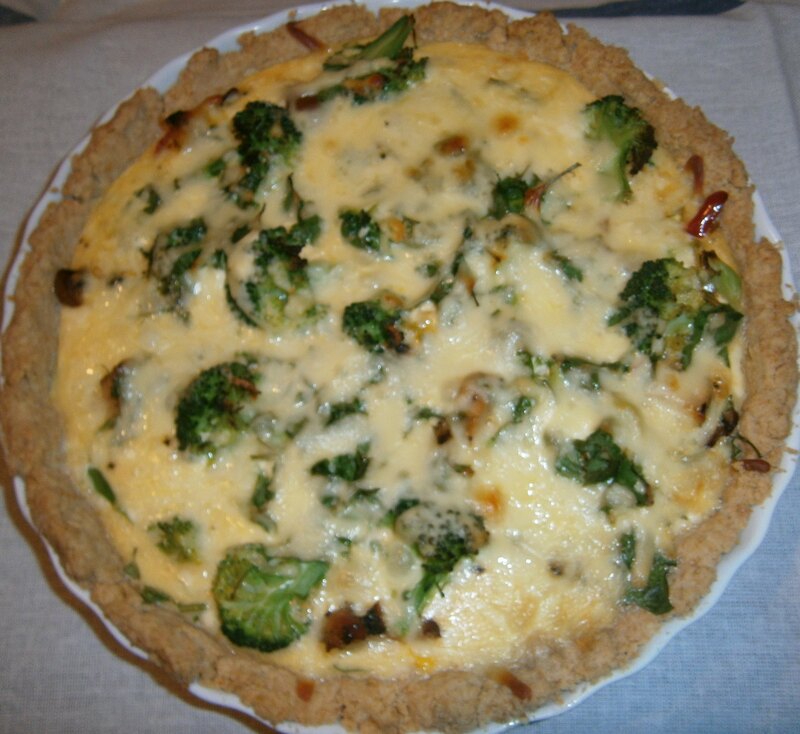 Spread parsely and cheese evenly over the top. Bake in moderate oven for about 25-30 minutes, or until set. Serve with peppery rocket, parsley and tomato salad. There is nothing like a hot beef stroganoff on a cold miserable night – you just shouldn’t feel the need of one in February in Sydney… however, it is cold and windy and generally horrid out there, and so the strog seemed like an excellent option. 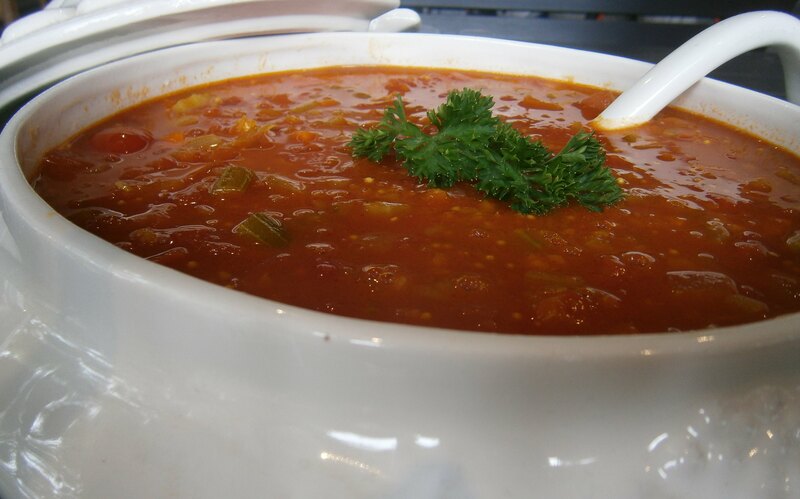 We had a lot of this kind of food when I was a kid – being in a place with snow and blizzards in the winter stews and casseroles were just a part of life. 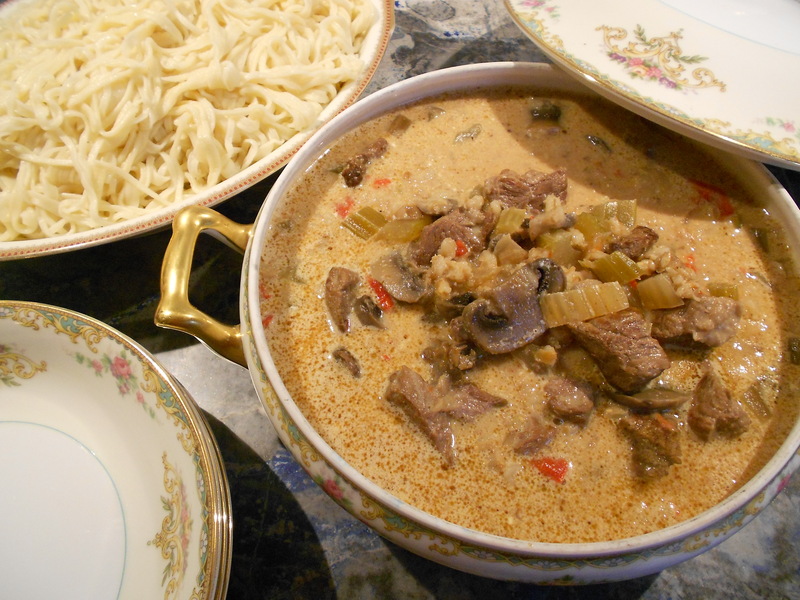 This recipe is one of my grandmother’s, although I am sure stroganoff isn’t her original name for it. My grandmother used to bake this one in her oven, but these days I use my slow cooker. The strog can be served with rice or pasta or bread. I have used home made pasta this time, but I will talk about that on another day. Preheat slow cooker on low. Brown beef, onion and garlic place in slow cooker. Stir in remaining incredients except mushrooms and sour cream. Turn slow cooker up to high and cook for 1 hour. Turn back down to low and add the mushrooms. Leave to cook until meat is tender and barley is plump and soft. Stir in sour cream if planning to serve immediately, otherwise turn off slow cooker and leave to cool overnight and add sour cream when reheating. The best way to start my baking bohemian blog is with a recipe that comes from Bohemia – back when it was still its own country. Bohemia’s history goes back more than 2000 years, although the first proclaimed King of Bohemia was crowned in 1085. Due to events during both World Wars, the country was divided and re-divided amongst neighbouring countries during the 1900s. Bohemia now comprises two thirds of the Czech Republic. My family left Bohemia during the turmoil of WW1 and emigrated to Chicago. As with many cultures, food played a vital role in family and community life. Many recipes have been handed down through the generations, along with the joy of cooking and sharing meals with family and friends. So I am starting this blog with one of the favourite recipes from the family : hoska. Hoska is a sweet yeast bread, best eaten warm from the oven with lashings of butter. You must have fresh yeast, and it works better with proper bakers flour. All of the Bohemian families I knew grew up eating hoska but my family’s hoska was the best ever. Wal, the very not-bohemian man about the house, will eat a whole loaf in one hit, which is always gratifying for the baker! 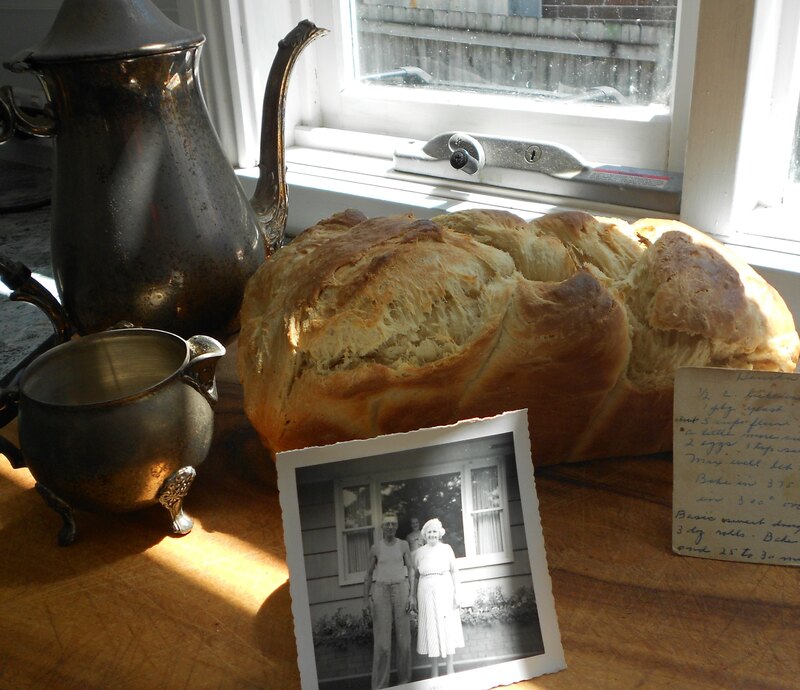 The version below is from my great-grandmother, and is a dense but soft bread – very filling. Dissolve 2 t sugar in the lukewarm milk and stir in yeast. Leave to one side. Mix dry ingredients. Lightly beat eggs and vanilla. Pour egg mix, milk, softened butter into flour mixture and mix with wooden spoon til ingredient begin to stick together. Add yeast mixture (it should have a foamy bubbly surface now) and dried fruit (if using) and mix til ingredients just combined. Turn out onto floured surface to knead. Knead gently til dough develops silky soft texture. Do not overdo it or the dough will toughen. Leave in bowl in warm spot (not in direct sunlight) covered for about an hour. It should nearly double in size. Lightly knead the dough again and divide into 3 equal pieces. Roll out each piece into a strip so that you can make a braid out of the dough. Once braided, place in lined loaf pan. Brush lightly with milk or egg yolk. Bake in oven at 180 C for 15 minutes, then at 165 C for a further 30-35 minutes. Leave for at least 5 minutes to cool slightly in pan. Enjoy with butter only or add jam or honey. Yum!